During my research work at the Italian Cultural Institute of Copenhagen, I accidentally learned about the Reform of the Ministry of Foreign Affairs occurred in 2010 while discussing with the Ruling Cultural Attaché about the operations of the Institute. The Reform determined a reorganization of the internal structure of the Ministry, as well as, of the external network of offices spread all over the World. On that occasion, a new course was envisaged for the 89 Italian Cultural Institutes (IICs), which has its core element in the necessity to promote Italian culture, economy and research as elements of an organic system. Despite the seemingly little relevance of the new directives, they actually represented, at least at the theoretical level, a noteworthy change intended to affect the operations of the IICs. After that first brief but nonetheless intriguing conversation I decided to analyze the network of the Italian Cultural Institute of Copenhagen, to understand which have been the actual effects, if any, of the new course on the operations of the IIC; more precisely, I have focused my attention on the collaborations established between 2006 and 2013 by the Institute with Danish and Italian partners trying to identify the alliances aimed at the promotion of the whole Sistema Italia. 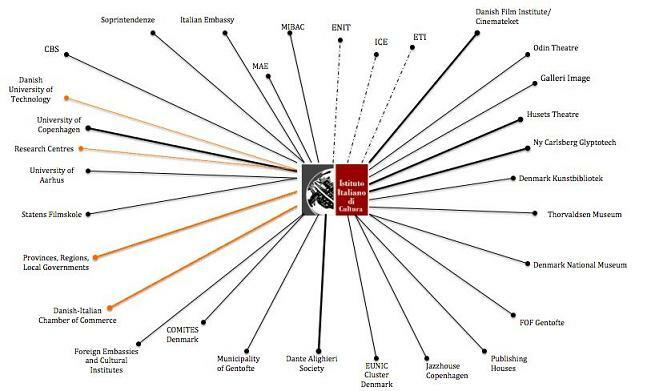 The framework used when investigating the partnerships involving the IIC of Copenhagen has been the one of the network analysis. The term network refers to a set of actors connected by a set of ties (Freeman, 2006). The nodes of the network (i.e. the actors) can be represented by people, organizations, concepts and so on. Whenever the attention is focused on a single actor, this focal point is called ego, while all the actors with which it is connected are defined alters. The ensemble of the ego, its alters and all the ties connecting them is what we define ego-network (Borgatti & Foster, 2003). The type of synergies existing between the partners, the determinants of the relationships and the role undertaken by the Institute have been considered when analyzing the collaborations. The choice to investigate the effects of the Farnesina Reform on the operations of the IIC of Copenhagen analysing the partnerships established by the IIC before and after 2010 can be easily understood considering, first of all, that the Institutes spread all over the World work in constant cooperation with local and Italian actors; secondly, considering that at the heart of the Reform lays the idea that in the future the collaboration among actors belonging to the most different sectors will be essential to successfully promote our multifaceted cultural, scientific and productive heritage abroad. The analysis of the evolutions of the ego-network of the Institute of Copenhagen will then represent a veritable litmus test to understand the implications and consequences of the ministerial change. Even though the IIC of Copenhagen has been established more than fifty years-ago, as the analysis is concerned with the changes occurred after the 2010 reform, the partnerships considered will be only those established from 2006 onwards. This choice is also based on the fact that an online database of the initiatives organized by the Institute since 2006 is available online and can be accessed through the IIC’s website; clearly, this database has represented a valuable and reliable source of information when collecting the data. Additional details concerning the initiatives organized have been collected interviewing the personnel of the Institute and reorganizing the official archive. The Presidential Decree n° 95 of the 19 May 2010 determined a reform of the Italian Ministry of Foreign Affairs (MAE). The Decree of Reorganization of the MAE was aimed at the rationalization and upgrade of the internal structure of the Farnesina; the changes required by the Reform were meant to enable the Ministry to face the new challenges connected to the process of globalization and to its financial consequences, to the participation to the European Union and to the need to restore the Country’s budget to balance. One of the most evident outcomes of the Reform was the rationalization of the Ministry’s internal structure, which took the shape of a reorganization and downsizing of its General Directorates. In point of fact, the Directorates have been reduced from twelve to just eight and their competencies have been established on the basis of macro-sectors representing the most crucial priorities of Italian foreign policy. What appears particularly noteworthy is the explicit connection established on occasion of the reform between the promotion of Italian culture and language abroad and the one of the whole national economic system. To this regard, particularly telling has been the creation of the General Directorate for the Country’s Promotion (hereafter DGSP), which has replaced the former General Directorate for the Cultural Promotion and Cooperation. As a matter of fact, the DGSP was established with the objective to involve and channel all the possible financial, cultural and scientific resources into projects aimed at the international promotion of the whole country; the innovative element in this case is connected to the fact that, for the first time, Italian Economy, Culture and Research will not be represented and promoted abroad as separate sectors, but rather as components of a single organic system (namely, the so called Sistema Italia). The rejection of a fragmented approach to the promotion of our Country in favour of a more “systemic” one would enable Italy to face the international competition and to better recover after the recent financial crisis. The network of the DGSP is composed by hundreds of actors spread all over the world: 261 lecturers, 293 scholars, 21 scientific attaché and 89 Italian cultural Institutes. The Italian cultural Institutes represent then not just pivotal elements of Italian cultural diplomacy, but also crucial tools to promote the national culture abroad. As a consequence of the envisaged new course the Italian Cultural Institutes, which are part of the area of competence of the DGSP, have been asked to promote the whole Sistema Italia, rather than focusing merely on national language and culture. Since the drafting of the cultural bilateral agreement of 1956 between Italy and Denmark, the two countries resolved to engage in a continuous mutual collaboration with regards to cultural initiatives and activities. When analyzing the situation of Denmark in relation to the diffusion of Italian language and culture, several representatives of Italian cultural and linguistic heritage are to be found. Obviously, the most relevant role is played by the Italian Cultural Institute of Copenhagen, whose mission is to promote and spread Italian language and culture in Denmark through the organization of cultural events aimed at fostering the circulation of idea, arts and science. The IIC, established in 1958, runs a library and a videoteque, organizes language courses and a vast array of initiatives, ranging from concerts to conferences. The staff, downsized between 2012 and 2013, is composed by only five people: a Ruling Cultural Attaché (Addetto Reggente) and four employees working by contract. The events and initiatives organized by the IIC, as well as, those simply featuring its collaboration, are based on partnerships. The actors with whom the Institute has collaborated between 2006 and 2010 are many and remarkably diverse, among them are to be found: relevant Danish cultural institutions (such as: the National Film Institute and the Danish National Museum), Danish Universities, local Committees of the Dante Alighieri Society, Italian Chambers of Commerce, Italian Regions, Provinces and Local Authorities, Italian Ministries and Official Agencies (e.g. ENIT, ICE, ETI), Foreign Cultural Institutes (e.g. Institut Francais, British Council, Finnish Cultural Institute and so on.) and other local partners (such as: art galleries and committees organizing festivals and fairs). Figure 1 offers a graphic representation of the IIC’s network between January 2006 and the beginning of 2010. Some of the depicted partnerships, such as the one with the committee of the Dante Alighieri Society were repeated over time, while others have been established simply in order to organize a specific event; this distinction is represented graphically by the varying thickness of the segment connecting the IIC to the nodes (i.e. specific partners): repeated collaborations are signaled by lines, which are remarkably thicker than those representing episodic partnerships. Figure 1. Graphic representation of the IIC’s Ego-network before the Reform of the MAE (2006 – 2010). While analysing these remarkable diverse number of collaborations we are often faced by Complementary Partnerships; a partnership is defined Complementary if the two actors contribute with complementary activities to the realization of the project/ initiatives. Furthermore, in this case no competition is to be found between the two partners and they set themselves on the market autonomously and independently from one another. A clear example of this type of partnership is represented by the collaboration with the Danish Cinemateque, which was mainly aimed at the realization of movie retrospectives; in this case, the IIC participated mainly and almost exclusively during the first phase of the organization of the event. As a matter of fact, it could be said that the Institute’s contribution used to fill an initial gap in the production line, as it provided the Cinematheque with one of the needed films bearing the expenses connected to its loan, transport and insurance. Once the retrospective started, the IIC employed its communication tools to inform its audience, but the relevance of this activity was limited, given the wide range of communication instruments available to the Cinematheque. Unquestionably less common appear instead the so called Quasi-concentration Partnerships, which calls for continuous transactions and adjustments between the partners, as in this case the alliance covers all the main functions involved in the realizations of projects. Examples of this second type of alliance are represented by the collaborations with the other cultural institutes member of the EUNIC Cluster Denmark and by the one with the Ny Carlsberg Glyptotech, which is one of the most well known museums in town. In this case, the IIC actively participated to the design and organization of the initiatives and in some cases it even acted as a broker, namely as an actor “mediating the flow of information and knowledge between unconnected actors” (Burt, 1992). Furthermore, they are often characterized by the leading role of the Institute and by a correlated conspicuous commitment in terms of both financial and human resources. “ before the Reform the organized initiatives were characterized exclusively, or at least mainly, by a cultural approach and aim; on he contrary, now the events stem from coordinated activities and joined efforts, which are concerned with the promotion of the whole country and of its productive system”. Remarkably, despite the significant changes that should reasonably be expected given the theoretical premises, when considering the partnerships established and the projects realized during the past three years it seems that no radical change has occurred. 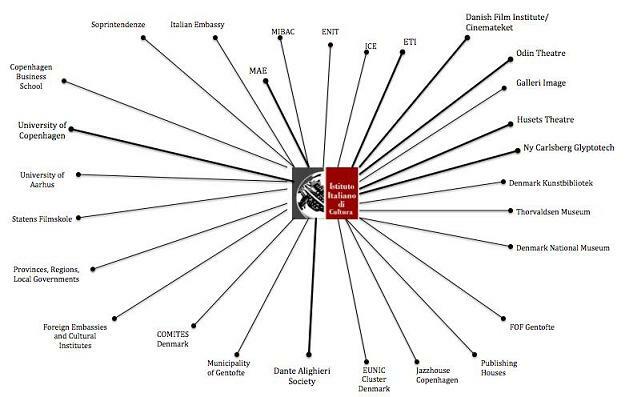 As showed by the graphic description of the IIC’s network after the Reform (see Figure 2), the IIC has almost entirely safeguarded the established partnerships with Danish cultural institutions, such as the Odin and Husets Theaters, Danish Film Institute and Cinematheque, Ny Carlsgerg Glyptotech, Thorvaldsen Museum, University of Copenhagen and so on. Similarly, the Institute has offered during the past years its support to the committees managing some of the most famous Festivals taking place in Copenhagen and with this regard particularly noteworthy are the collaborations established in occasion of the Jazz Festival and the festival Gentofte Kultur und Festdage, whose distinctive features, in terms of both synergies and determinants of the relationships, have not changed after the Farnesina Reform. However, a series of long standing collaborations have evolved towards Quasi-concentration Partnerships, as in the case of the previously described collaboration with the Danish Cinematheque. On top of that the collaborations with Italian Regions, Provinces and Municipalities, which were originally established in 2008 by means of a dedicated initiatives conceived by the former Director of the IIC, have been strengthened. The relevance of such partnerships is undeniable when it comes to the promotion of Italian art, culture, territory and top-quality products. Furthermore, in a situation of constant paucity of funds, the possibility to partner with actors who, as in this case, are able to face the majority of the expenses connected to the organization of the event, while being determined to realize noteworthy initiatives, represent the value added of this type of collaborations. Leaving aside already established, and in some cases evolving, collaborations, two different groups of brand-new partnerships have been identified (highlighted in orange in the graphic representation of the IIC’s Ego-network). The first group concerns the collaborations established with Italian researchers, professors and PhD employed by Danish Universities and Research Centres; these collaborations, aimed at the promotion of the sector of scientific research, have taken the form of conferences held periodically at the Institute, which are all part of a dedicated talk series called Italian Researchers in Denmark. The new relevance given by the Institute to Italian researchers and professors appears totally in line with the recommendations of the Minister Franco Frattini, according to which the worldwide network of Italian researchers, PhD and scientists should be enhanced; as the Minister has pointed out, these professionals spread all over the World do not represent merely people that should be attracted back as soon as possible, but rather “outstanding ambassadors of Italian research and science” (Official Hearing of the Minister Frattini, 6 July 2011). A further type of significant collaborations are those recently established with the brand new Danish-Italian Chamber of Commerce, created in 2012 after a series of negotiation with the Italian state body Assocamerestero. The potential of partnering with this actor when it comes to the promotion of the Sistema Italia in Denmark is noteworthy, as the Chamber of Commerce is in charge of supporting Italian firms wishing to enter the Scandinavian market, as well as, of fostering the promotional effort of Danish companies thanks to its network of partners in Italy. The relevance of the collaboration with the Danish-Italian Chamber of Commerce and with the Italian Chambers of Commerce in general can be understood recalling the requirement to promote the whole Sistema Italia, which also entails the promotion of the national productive system. Interestingly, interviewing the professionals working at the IIC, it has come to light that the operations of the Institute, and especially its effort to promote the Italian productive system, have been negatively affected by external factors. Among the most mentioned elements a series should be highlighted, namely: the closure and rearrangement of the offices of both the Agency of Foreign Trade (ICE) and the Italian Agency for the Promotion of Tourism (ENIT) in Denmark, which occurred respectively in March 2013 and November 2005. Furthermore, equally disruptive has been the effect of the abolishment of the Italian Theatre Agency (ETI) in May 2010, with whom the Institute has partnered several times in the past on occasion of a well-known international Theatre Festival. As a matter of fact, right when higher levels of collaboration have been requested to all the members of the network of Italian actors, agencies and institutions active at the international level, the Institute has watched helplessly to the dissolution of potentially crucial partners. In general, as pointed out by members of the staff of the IIC, lately they have witnessed a constant reduction in the number and size of the Italian offices representing our country in Denmark and more generally in the Scandinavian area. The direct consequence of such choices made at the central level, generally in order to save money and invest in more appealing countries, has been particularly negative for the Institute, which is presently obliged to face not just a decrease in the available resources, but also in the number of strategic partners active locally. When taking into consideration the present and future scenario in terms of established collaborations, desirable development of the network and compliance with the ministerial guidelines, a series of criticalities hampering the operations of the IIC can be detected. The most noteworthy challenges appear connected to the endemic paucity of resources, both human and financial, and to the difficulty in finding Italian companies operating in Denmark and wishing to sponsor the Institute’s activities; in point of fact, as highlighted by the Ruling Cultural Attaché, the limited number of Italian company active in Denmark or interested in entering the Scandinavian market negatively affect the ability of the IIC to set fruitful collaborations with Italian partners willing to financially support even individual activities. The analysis of the continuous struggle to find suitable sponsors has highlighted also the lack of appropriate coordination activities at the Ministry level; in this respect, it seems that, despite the continuous call for a new approach to the process of country’s promotion, the Ministry has failed to offer the necessary support facilitating the creation of synergies between the Institute and potential partners belonging to the business sector. In the previous sections the evolution of the network of the IIC of Copenhagen has been brought into focus. Several relevant elements have been highlighted, such as: the tendency to safeguard existing partnerships, the enhancement of the collaborations with Italian Chambers of Commerce and Local Governments, the evolution of long-standing collaborations towards new projects and the effort at establishing meaningful relationships with Italian researchers, PhD and professors employed by Danish universities and research centres and with the brand-new Danish-Italian Chamber of Commerce. Even though no radical change has been detected analysing the network before and after the Reform of the MAE, the resolution to comply with the envisaged new course promoting not simply Italian cultural heritage but the whole Sistema Italian appeared palpable. As a matter of fact, the strengthening of the partnerships with Local Governments and with the Danish-Italian Chamber of Commerce and the creation of new collaborations with Italian researchers and professors seem totally in line with the recent ministerial guidelines concerning the promotion of Italian productive system, top quality products and research sector. Unfortunately though, during the analysis of the partnerships, as well as, while interviewing the professionals working at the IIC, a series of criticalities hampering the operations of the Institute and its projects towards the promotion of the whole Sistema Italia have been highlighted. Hoping for a future increase in the ministerial endowment or in the allocation of other professionals to the IIC would be vain, since, considering the trend showed during the past years and the fact that Denmark can not be numbered among the most appealing and promising markets for Italian firms, the contrary would be far more plausible. On the contrary, the present asset of the IIC should be borne in mind and considered as the pivotal element around which to design new strategies. Given the fruitful collaborations established since 2008 with Italian Regions, Provinces and Local Governments, it would be highly recommendable to keep investing on these partnerships. Once the collaboration has been established it would be important to nurture the relationship with the local actors in order to design a series of initiatives and projects together rather than a single event. Understandably, the value added of a repeated collaboration is based upon the fact that, since the partners have already worked together, they are aware of the skills and knowledge owned by the other actors and plausibly they are bond by reciprocal trust and respect. Apart from strengthening the relationships with Italian Local Governments, the Institute should also focus on the existing collaborations with other Italian Cultural Institutes located in the Scandinavian area and in bordering countries; in this case essential would be the identification of suitable occasions to meet in order to design workable projects together. Partnering with fellow Italian Cultural Institutes appears a viable strategy, as plausibly all of them have to face similar criticalities (see data concerning downsizing of personnel on the Annuario Statistico year 2012 and 2013). Even though no qualitative data have been collected to ascertain this assumption, judging from the size of the personnel employed by every IIC in the Scandinavian area and by the fact that from the Ministry point of view this part of the World is not as potential for the business sector as others, it is reasonable to imagine the IICs of Oslo, Stockholm and Helsinki struggling because of limited resources. Furthermore, most probably the collaboration would be eased by the fact that the Institutes share the same general goals, as well as, the same organizational culture and governance structure. Last but not least the IIC should carefully reconsider the pros and cons of established collaborations. As the aim of this paper is to investigate and discuss the evolution of the network of the Institute after the Reform of the Ministry of Foreign Affairs, considerations on the significance of each single partnership would be inappropriate; however, given the mentioned limitation in resources and the resulting risk to consciously or unconsciously favor initiatives requiring limited investments in terms of money and time, which might on the long run negatively affect the IIC’s image, role and status, the partners portfolio of the Institute should be reconsidered. As has been previously argued, when the Institute engages in complementary partnerships its contribution is generally limited to the provision of standard services and consequently it plays a minor role; conversely, in case of quasi-concentration partnerships, which are more demanding and time-consuming, the Institute had a leading role and was involved in each phase of the projects from the design to the final realization. In order to avoid non-rewarding dispersion of resources, the Institute could focus on a more restricted number of collaborations thus saving a sufficient amount of resources to be allocated to a series of partnerships aimed at the realization of projects of wide-scope. In conclusion, it seems that possible solutions to the challenges faced daily by the IIC and to the need to comply with the new course are, so to say, only one partnership away. Despite the need to rethink the established collaborations and the role that the Institute should undertake, the IIC’s network still represents a fundamental resource. Insofar as the amount of available financial and human resources is reasonably one of the main focuses of attention when analysing the situation of such an organization, the dissertation has hopefully demonstrated that its network of partners is an element, which could make the difference. Investing in partnerships carefully selected, rather than in all the existing collaborations regardless of their potential and long-term outcomes, the IIC might be able to comply with the process of Country’s promotion, while enhancing its reputation as valuable cultural venue in Copenhagen.